Sidney Cotton in the cockpit of his post-war Lockheed 12A G-AGTL. Note the tear-drop side window which was invented by Cotton. Just prior to the outbreak of WW2, one of Cotton's earlier Lockheeds had so impressed his German hosts that they described it as the "Kolossal Lockheed". Frederick Sidney Cotton was born on 17th June 1894 at Gooranga near Proserpine, Queensland, Australia. In 1900, the Cotton family moved to a property near Brisbane. Sidney attended Southport Grammar School in 1904 and six years later the entire family left for England where it was intended that the children should further their education. Shortly after arrival in England, young Sidney incurred the wrath of his father by slipping away to Brooklands Aerodrome. However, his father relented and Sidney visited Brooklands regularly thereafter. During his stay in England, he built a six foot glider which he powered with a small six cylinder petrol engine. The family returned to their Queensland property "Hidden Vale" in 1912. Sidney's father wished his son to follow in his footsteps by becoming a station manager, but Sidney often upset his father with his interest in machines. When he was staying on the property of a friend, supposedly to gain experience in station management, he built a motor car with the help of the station owner, a friend of his father. The car was a rather innovative design and was later fitted with a professionally made body. An event which shook the world, the sinking of the "Lusitania", incensed Sidney and he decided to go to England to join the forces. He joined the Royal Naval Air Service and learned to fly in 1916. His understanding of camouflage was demonstrated when he disguised his Sopwith 11/2 Strutter bomber by painting a large black dot aft of the cockpit. This modification, together with the fitment of a gun-ring, made his bomber look like the fighter version from a distance. In the winter of 1916, several members of his squadron returned from a mission practically frozen. Sidney Cotton, however, was not troubled by the cold, a fact which he attributed to his oily overalls which he did not have time to change out of in the scramble to get airborne. He concluded that the oil sealed the fabric and trapped a layer of warm air next to the body. He had his tailor make up a special suit of a light Burburry material with a lining of thin fur and air-proof silk together with fur cuffs and neck. He registered his design as the "Sidcot Suit" which was worn extensively thereafter. Alcock and Brown wore such suits during their epic crossing of the Atlantic. Also, when Manfred von Richthofen was shot down, he was found to be wearing a suit of similar design. Sidney Cotton first came into conflict with his military superiors when it was decided by the Admiralty that a colleague of Cotton's should carry out a long range Zeppelin patrol. There were two DH4 aircraft available, those belonging to Cotton and another pilot by the name of Fane. Cotton's aircraft had been modified with an extra water tank to alleviate overheating. Fane's aircraft was not modified and it was he who the Admiralty decreed should carry out the patrol. When Cotton protested that he should go, he was promptly told to obey orders. The predictable result was that Fane's engine overheated and he was forced down into the sea to be picked up three days later. A flying boat sent to look for him was also lost. As a result, Sidney Cotton resigned his commission. In 1918, he returned to Australia to manage his father's apple orchard in Tasmania. He surprised local orchardists by supplying the IXL canneries with one thousand tons of apples in one season. Ever worried by wastage, he found that he could make a very pleasant apple jelly from the peels and cores. He later pioneered the development of dehydrated vegetable soups. However, he soon became disenchanted with life on the land and returned to England. Shortly after, he left for Newfoundland where he planned to operate an aerial spotting service for the sealers. The sealers, however, failed to appreciate the usefulness of such a service and the venture folded. Cotton returned to England where he ran a patent introduction service. He also followed the stock market with considerable success. In the early 1930s, he participated in the development and marketing of a revolutionary colour film which sold under the name "Dufaycolor". In September 1938, Germany was preparing for war and the need for reconnaissance of German industrial centres became urgent. As Cotton had regularly flown his own aircraft to Europe on business, it was considered that his presence in Germany would be fairly inconspicuous. It is not surprising therefore, that he was offered the job and accepted it. Cotton requested a Lockheed 12A (G-AFKR) which was delivered in January 1939. The operation was conducted initially with the help of the French who provided an enormous aerial camera which necessitated the installation of a large hatch in the aircraft for jettisoning the camera should the purpose of the flights be discovered. 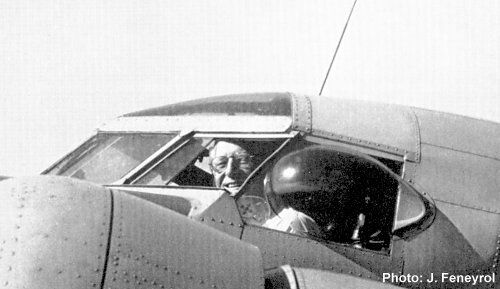 It was during one of these flights that Cotton discovered the demisting principle when he found that frost could be removed from the windshield by leaving one of the cockpit windows open slightly. Such was the design of the Lockheed 12A that the airstream drew warm air from the cockpit and across the windshield, thus causing the ice to melt. The limitations of the French supplied camera soon became apparent and Cotton designed a frame to carry three Air Force F.24 aerial cameras which were not only more efficient but considerably smaller. It was intended that the cameras and associated equipment be stored in specially decorated suitcases when not in use. Cotton also resolved to use Leica film and fine-grain developer to improve the picture quality. In April 1939, a lengthy series of flights took place over Sicily and North Africa. Cotton's good relations with Customs officials, together with a bit of subterfuge, ensured that the elaborately decorated suitcases escaped inspection. After this series of flights, G-AFKR was handed over to the French, largely due to Cotton's dissatisfaction with their methods. A second Lockheed 12A (G-AFTL) arrived in May 1939. The aircraft was modified with two extra fuel tanks, each of 70 gallons capacity, which were fitted in the cabin. This modification increased its range from 700 to 1600 miles. Although Lockheed agreed that the extra fuel load was within the capabilities of the aircraft, the authorities ruled that fuel uplifted should be well below the capacity available. Cotton therefore resolved that the tanks would be inadvertently filled to capacity when required. On his first take-off with a fuel overload, Cotton could not resist flying around the control tower and waving to its occupants. In order to achieve downwards visibility, Cotton invented the teardrop window which he fitted in place of the Lockheed's side cockpit window. The Triplex company manufactured about 100,000 of these windows during the war but Cotton claimed no royalties as they were fitted only to military aircraft. One day at Heston, Cotton was watching the departure of the Maharajah of Jodhpur in his private aircraft, another Lockheed 12A G-AFXP, when he noticed that the aircraft disappeared from view shortly after take-off. The aircraft was painted a pale duck egg green colour and Cotton concluded that it had blended with the sky. Cotton requested the Titanine Dope Company to make up a similar paint, slightly lighter in hue, and registered it as "Camotint". This paint was then applied to Cotton's second Lockheed 12A G-AFTL. In July 1939, Cotton flew the aircraft to Germany at the invitation of a business associate, Herr Schoene, who was involved with the marketing of "Dufaycolor" film in Germany. Schoene had many influential friends, one of whom was Goering. For the purpose of photographing German industrial installations en route, Cotton had two Leica cameras (ironically of German manufacture!) fitted behind close-fitting sliding panels under the wings. The sliding panels were powered by a small electric motor controlled by a switch hidden under the pilot's seat. The cameras were capable of taking 250 exposures each. In addition to the Leicas in the wings, Cotton carried two others hidden in the cabin. Cotton flew back to Heston with the photos and promptly returned to Germany to attend a flying rally at Frankfurt at the invitation of the Commandant of Tempelhof Airport. Cotton's "Kolossal Lockheed" evoked considerable interest at the meeting and the Commandant requested a local flight. Cotton had been asked to obtain photos of Mannheim so he explained to the Commandant that a favourite aunt of his had enthused about the beautiful scenery along the Rhine at Mannheim. The flight was duly authorised and Cotton got his photos. With preparations for war proceeding, it was reported by close associates of Goering that he believed that Britain would not go to war over the invasion of Poland. Cotton was of the belief that war might be averted if Goering could be impressed with Britain's willingness to fight. To this end, he offered to fly Goering to England for discussions. Preparations were well under way when war was imminent and Cotton was forced to leave Germany. In fact, Cotton's Lockheed 12A G-AFTL was the last civilian aircraft to leave Germany before hostilities commenced. After the outbreak of war, Cotton continued with aerial photography at the request of the military whose own attempts had proved unsuccessful. The unit, which was later to be called cryptically No. 2 Camouflage Unit, initially operated Blenheims which were later replaced by Spitfires, both types being specially modified for high altitude photography. During the war, Cotton had an idea which led to the development of the Turbinlite Havoc. The Havoc was equipped with early radar together with a powerful Helmore Turbinlite searchlight in the nose. Accompanied by several fighter aircraft, the Havoc would intercept enemy aircraft at night using the radar equipment. At the appropriate instant, the searchlight would illuminate the target for the fighters. With improvements in radar design, smaller units became available for installation in fighter aircraft and development of the Turbinlite Havoc was terminated. Cotton's dislike of "red tape", plus his desire to get things done, led to a high level plot to discredit him. Frustrated by bureaucracy and inter-service rivalries, Cotton left the RAF. Subsequently, he mounted an airlift operation on behalf of the Muslim state of Hyderabad using five Lancastrians. In the early 1950s, in a showing of remarkable foresight, Cotton had business dealings with Saudi Arabia in an attempt to obtain oil concessions for Australia. Post-war, Cotton used the Lockheed 12A G-AGTL "Caprice". Sidney Cotton, who had been awarded an OBE in 1941, died in 1969. The preceding biography is a precis of "Aviator Extraordinary" - the Sidney Cotton Story as told to Ralph Barker (Chatto & Windus, London 1969. SBN 7011 1334 0). This precis was prepared in 1975 by Ron Cuskelly who now finds that he can't improve on it by much! The above photo, together with another of G-AGTL, have been taken from the book with due credit to the photographer J. Feneyrol. Although it is policy to include on this site only Lockheed aeroplanes which took up an Australian identity, an exception has been made in the case of these aeroplanes as they were owned and made famous to varying degrees by an Australian identity, Sidney Cotton. Several other Lockheed 12As which were owned briefly by Cotton's companies Aeronautical and Industrial Research Corp and Aeronautical Research and Sales Corp are listed separately.